Copenhagenize Design Company was pleased to have been invited across the Øresund to the grand opening of the City of Malmö's brand new Bike&Ride parking facility at the central station. On a sunny morning, the ceremonial ribbon - strung between two cargo bikes - was cut. 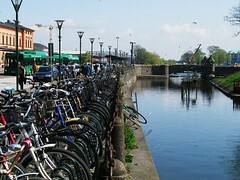 Malmö is Sweden's leading bicycle city - so much so that it features in the Top 20 on The Copenhagenize Index of Bicycle Friendly Cities. It is a premier bicycle city with around 30% of the population using bicycles each day to go to work or education. This brand-new Bike&Ride facility will host more than 1,500 bikes and there are even - be still our hearts - dedicated spaces for cargo bikes. 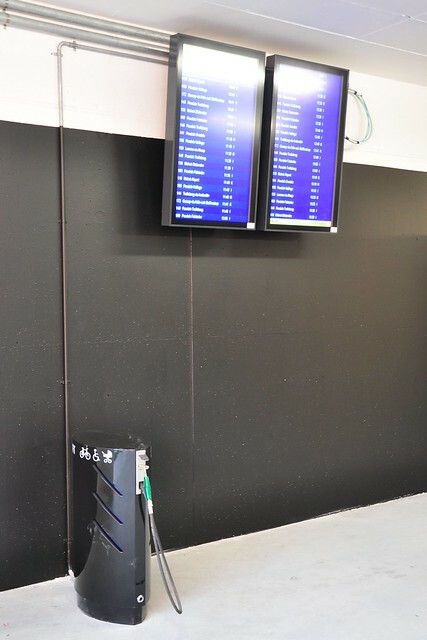 There are loads of details; two air pumps, a bike shop, lockers, numerous screens showing train departure and arrival times, restrooms, a lounge if you have to wait for the train. There is even a single shower for the odd "cyclist" who might fancy a spandex ride. Generally, the facility is geared towards the Citizen Cyclist population of the country's third largest city. Parking is free at Bike&Ride and there is 24/7 access. It is patrolled by station guards throughout the day. There is, however, a separate section for those who want some extra protection. 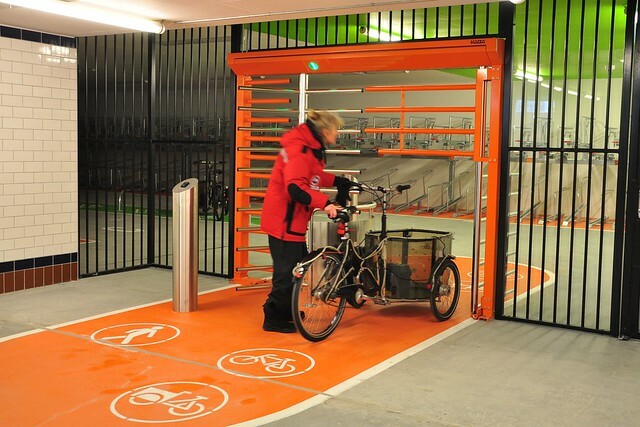 A secure parking area for 700 bicycles based on a subscription service. It costs 80 kroner a month and you get a chip card. Although if you have a transit card, you can combine it with that. There are numbers painted on the floor to help users remember where they parked so they don't have to wander around looking for a black bicycle in a sea of black bicycles. All of it with a fresh orange colour and cool, Nordic graphic design. 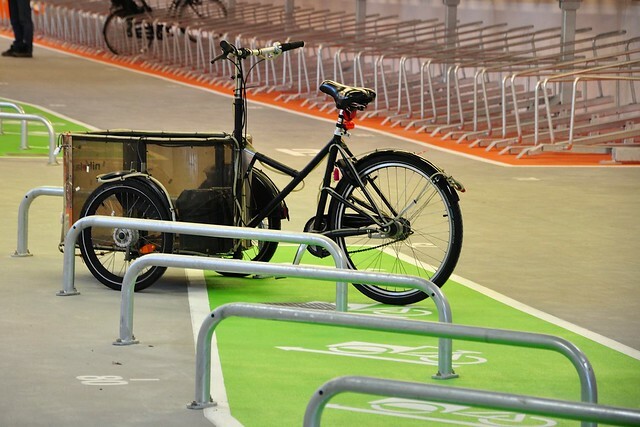 One great detail is the height of the bars in the cargo bike area. Too low for regular bikes to be leaned against them. Our über intern Dennis, who studies at the University of Utrecht, was impressed with the second tier bike racks. Excellent ease of use, he says. There is a low bar on them to lock your bike to and they require little effort to lift up and put into place. Access to the secure parking area is, of course, wide enough for cargo bikes, too. One of the waiting areas, with water fountain. 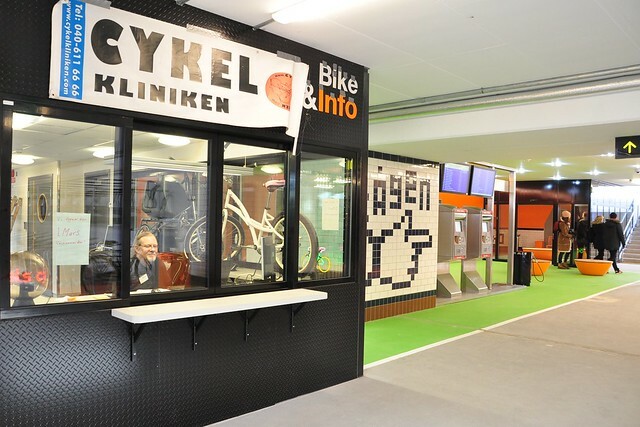 Bike&Ride is located under the bus station and connects directly with the train platforms. It's partially underground but it is lovely and bright because of excellent lighting and windows and glass doors. 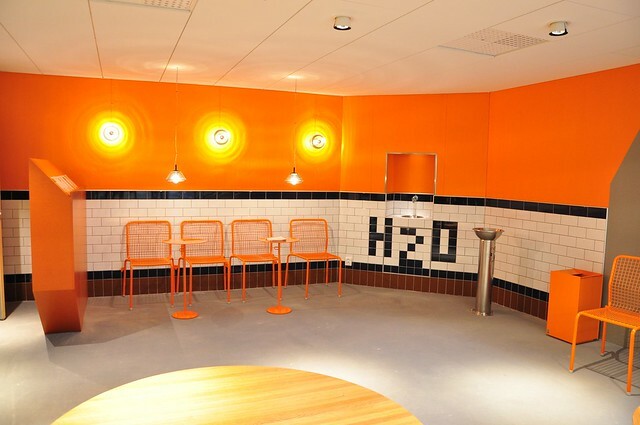 All the signs, pictograms and colours (orange and green) used make the facility attractive and user-friendly. We mustn't forget to highlight how important it is to use architecture and design to make sure facilities fit the users. 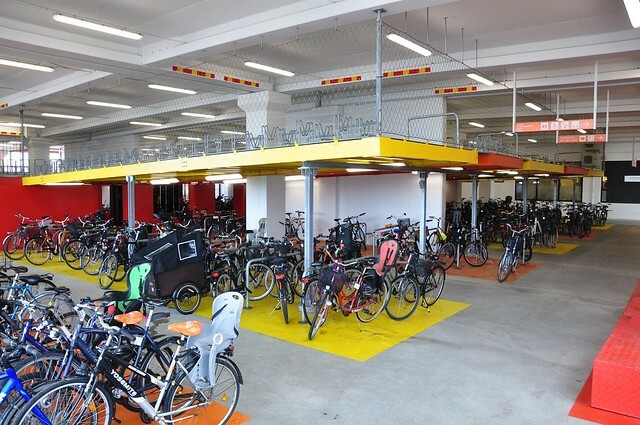 In comparison, the Bike&Ride parking located at Hyllie Station on the outskirts of Malmö that opened in 2010 seems less appealing even if it has the same facilities. 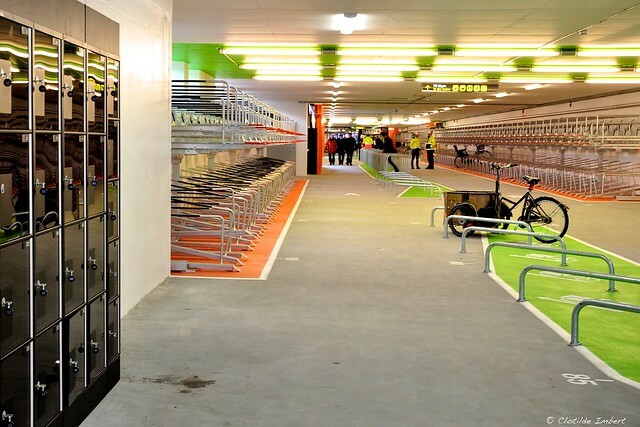 The upper level of bike parking is hardly used because you have to use a set of stairs with a ramp and the connection to the platforms is not at all direct. In the daily routine of a commuter, anything that makes it more inconvenient, however detailed, will not encourage them to consider changing their mode of transport. A2Bism is what we've always called it and Hyllie Station lacks that. Let's hurry up and get back to the new facility at Malmö Central. That's the main focus here. The City has proved how serious it is about improving conditions for cycling in an already exemplary cycling city. Their new Bike&Ride should embarrass the City of Copenhagen and they should be incredibly proud of it. Another 200 parking spaces are located outside, under a XIX century style roof. These spots are closer to the train station but, above all, they are important for the image of cycling. 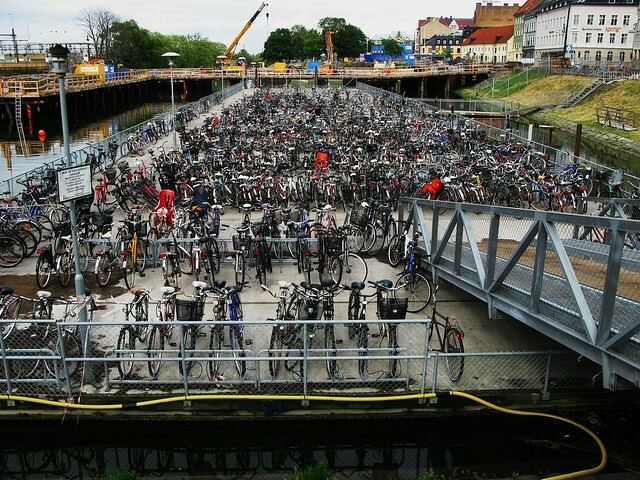 The City wanted to make sure that some bicycles remained outside the station. You don't want to remove them all. 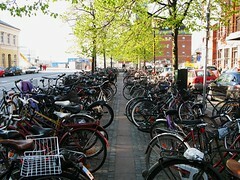 It's still important for everyone passing by to remember that Malmö is a bicycle city. Malmö has a vibrant bicycle culture and, in April, the City will recieve the results of a massive survey dealing with transport habits and we will know how the modal share of cyclists has changed over the last few years. Gathering data is something the Danes and the Swedes take very seriously. The bike shop called Bicycle Clinic. 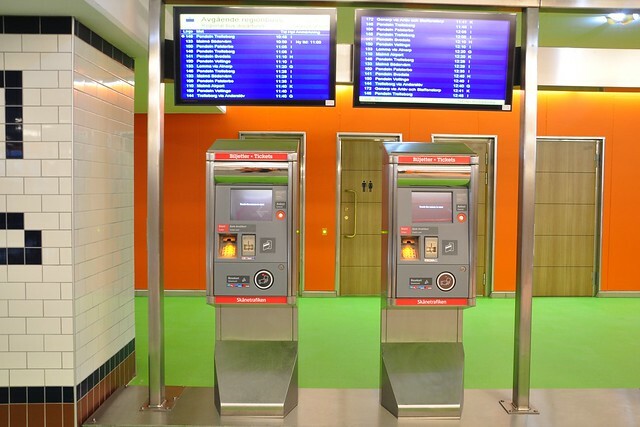 The ticket machines located conveniently at the bicycle parking. While we're dishing out love for Malmö here on Valentine's Day, we should also recall their brilliant behaviour change campaign - No Ridiculous Car Trips.